A man famous for a children’s book, Maurice Sendak was never one to box himself into any genre or description. I’m glad he was able to see and enjoy the film version of Where the Wild Things Are, which elicited some of my favorite moments from the author. 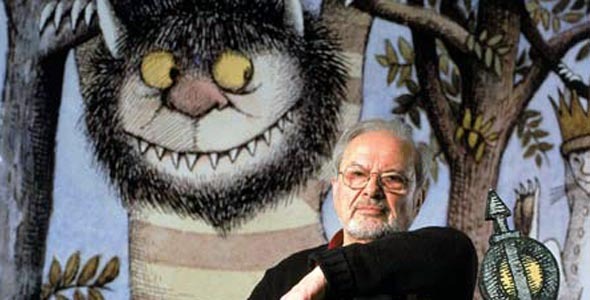 When asked how he would react to the parents who thought the film was too frightening for children, Sendak replied, “I would tell them to go to hell.” and to the kids “go home. Or wet your pants. Do whatever you like. But it’s not a question that can be answered.” The man was a curmudgeon, but a fun one and a genius as well. Considering that I try not to take celebrities deaths too hard, this has been one fucked up month. 08 May	This entry was published on May 8, 2012 at 10:26 am. It’s filed under art and design, books and magazines, film and tagged maurice sendak, stephen colbert, where the wild things are. Bookmark the permalink. Follow any comments here with the RSS feed for this post. Another book that absolutley transported me to another realm.